Semi-Precious Stones & Crystals: There are many others I like, but my favorites are heart shaped rutilated quartz and tourmaline. 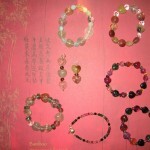 My previous co-worker Sendy introduced me to semi-precious stones. 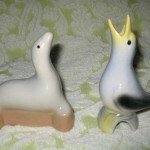 Vintage & Modern Pie Birds/Vents: Below are a picture of my two favorites. I prefer BIRD pie vents to all others. The first time I saw them was in a book entitled Vintage Vavoom: Romantic Decorating with One-of-a-Kind Finds by the editors Of Romantic Homes. 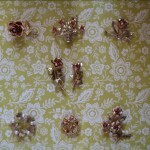 Vintage Pins: My most favorite is Krementz. Second favorite are specifically Coro doves. Vintage Florenza: I’m not sure how I became interested in Florenza. I suspect it’s from my search for vintage Krementz which led me to them? My first Florenza purchased was a bird I named “Chirpie.” He’s the one with the green rhinestone eyes. I have to find a better way to restore him. 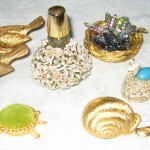 Vintage Rings: Lately I’ve been so nuts about vintage rings from West Germany, Sarah Coventry, and Avon. 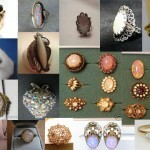 My absolute faves are the glass fire opals/faux opals. They are gorgeous! I’ve made a collage for you to peruse through.